After three short years he left the Forest and in 1944 the next incumbent to be appointed was a certain Robert Deakin, a man with good Forest connections. With patient and practical pastoral care and good leadership skills, he rapidly rebuilt the life of the Church in this district. 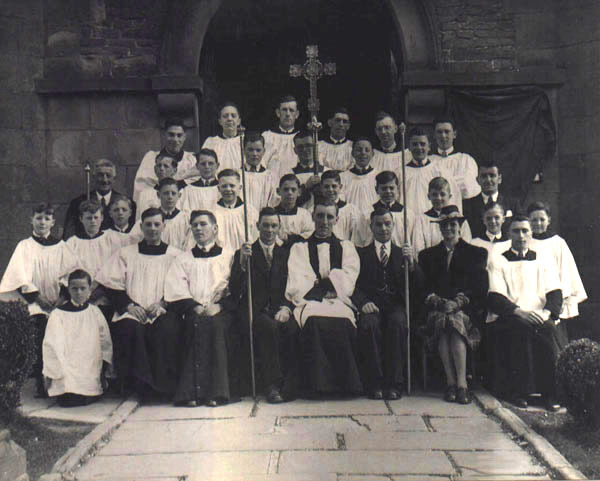 The picture below shows him in 1947 photographed outside the Church Door with the Churchwardens and Choir of the time. After serving with distinction as Vicar of Drybrook from 1947 to 1949, Robert Deakin was appointed Vicar of Charlton Kings (near Cheltenham) from whence he was Consecrated Bishop of Tewkesbury to serve as the Suffragan Bishop in Gloucester Diocese. The Reverend John Hall, another Forester, was the tenth Incumbent of this Parish. He was a forester and had been a chaplain in the Airforce. People still remember him as an athletic man and he accomplished the feat of visiting almost every house in the parish at least once in his time here ! In 1953, the Reverend William Barker became Vicar of Drybrook, a man of small stature but with energy and drive. He served as Vicar of this parish for 6 years. The Reverend Smith began work here in 1960 but only stayed in post as Vicar of Drybrook for three years. In that time he started “district congregations” on Ruardean Woodside and at Steam Mills. In 1964 the Reverend Edward Hiscox became Vicar, a great character who is still remembered with affection by many parishioners. “Ted” Hiscox had the amazing ability to forget appointments with great ease and countless tales are told of his late arrival at weddings and his skills at borrowing various items and then completely forgetting to return them! He served here for 11 years and he and his wife will never be forgotten. 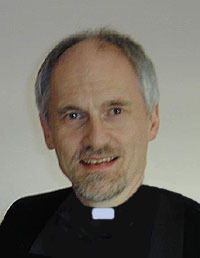 The Reverend Geoff Crago became the next Vicar in 1975, and was the first incumbent to live in the new Vicarage in Oaklands Road. He tried to bring the worshipping life of this Church “up to date” with varying degrees of success. The Reverend Alan Wadge was in office here for a relatively short time from 1980 – 1983. On leaving Drybrook he became a school chaplain.In 1984, the Reverend Michael Irving took this appointment. Michael proved to be an excellent Priest and a firm friend of many people, inside and outside the life of the Church, in his 7 years here. He left Drybrook to become Rector of Hempsted and the Diocesan Director of Ordinands and is now serving at Minchinhampton. In 1991 a Priest from the Liverpool Diocese, the Reverend Andrew James was inducted as the 17th Vicar of Drybrook, he served until January 29th 2006 making him the longest serving Vicar of the 20th century! 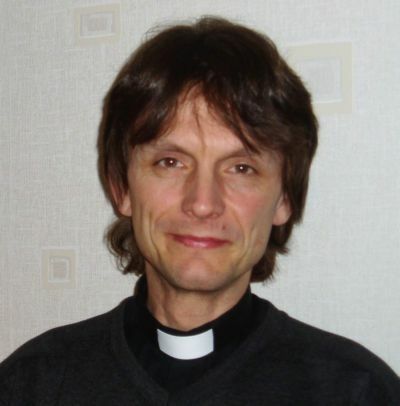 In April 2006, Andrew was inducted as Parish Priest at Hardwicke with Elmore and Longney still in the Gloucester Diocese though on the opposite side of the River Severn. On 21st January 2007, the Reverend Nick Bromfield was inducted as Rector of the newly combined parishes Drybrook, Ruardean & Lydbrook. Nick was previously at St. Mary the Virgin Church in St Briavels – also in the Forest of Dean.